Have you read the introduction to my Swedish cheese endeavors? If not, you probably should as I'm happy to report that the project is now fully underway! I've just returned from a week-long journey to Sweden's Västerbotten County in the pursuit of cheese-filled bliss. Johan, my personal Swede and lovely husband, joined me for the adventure and from Stockholm's Arlanda Airport we rented a car to enjoy a northbound roadtrip—destination Södra Svedjan for a farm-stay with none other than the very same Svedjan Ost I've previously referred to with great affection. Our stops along the way included Falun, Sundsvall, Skellefteå, and an afternoon pilgrimage to the holy land of Västerbottensost in Burträsk. We flew out of Nuremberg on a bright-eyed 6:00 AM Wednesday flight, landed in Stockholm just before 11:00, and by noon we'd taken possession of the rental car and were on our way. Our first stop was in Falun to briefly visit some of J's family—shoutout to Håkan, Helen and Tuva for hosting us!—and to give him a chance to reminisce about childhood summers spent alongside Lake Vällan, sleeping in quaint, quintessentially Swedish cabins. Falun activities included strolling through nature, reacquainting myself with the game of badminton, savoring delicious fish burgers and garden-grown new potatoes in the evening sun, and running the mental math on the purchase of this lake island—which is legitimately for sale at the price of 1.5 million Swedish Krona (approx. 146,000 EUR or 170,000 USD). The only catch is no electricity, no running water, and everyone around the lake watching your goings-on like a fish in a bowl, probably. But it's awfully pretty! Also pretty is the aforementioned Tuva, who is a two-and-a-half year-old Golden Retriever and a Very Good Girl. After Falun, we continued on to Sundsvall for a night, where we enjoyed this lovely view from our hotel room right in the heart of town. Sundsvall is a mid-sized city of about 100,000 people in Västernorrland County on Sweden's east coast, and visitors will quickly discover that its streets are peppered with dragons. This gif is a clip from my Instagram stories, and true to my claim I did investigate the prevalence of said dragons. As it turns out, Sundsvall is actually a city of two names, referred to as both drakstaden (the dragon city) and stenstaden (the stone city), and both names came about in the aftermath of a devastating fire in June 1888 that wiped out nearly the entirety of the city thanks to its primarily wooden construction. To help avoid similar disaster moving forward, Sundsvall was rebuilt in stone and the dragon was adopted as a symbol to protect the city against future fires. During the summer months, dozens of dragon sculptures are displayed throughout the streets, each one uniquely designed depending upon the company or persons who have sponsored the particular creature. Aside from the not-so-fierce dragons, Sundsvall has lovely architecture, a picturesque little harbor, and a youthful, creative vibe. Our stay was quite brief, but I'd be happy to return for a longer visit to discover more of the city's offerings. Our next stop was Skellefteå (think "shell-eff-tee-oh" for the pronunciation and you'll be close enough), where we shacked up for two nights at Stiftsgården Hotel, a remarkable property dating back to the 1500s. The manor pictured below was built in 1802 as a vicarage, and was promptly invaded by Russian soldiers in 1809. That the house still stands today is credited to a young hostess by the name of Margareta Renhorn, whose apparent hospitality during the occupation was warm and charming enough that the soldiers opted not to burn the place down when they left. Aside from the manor, which houses a respected restaurant and is where guest breakfast is served each morning, Stiftsgården consists of several buildings with a variety of accommodation options, conference and meeting space, and a wine cellar from the 1600s for private dinner groups. 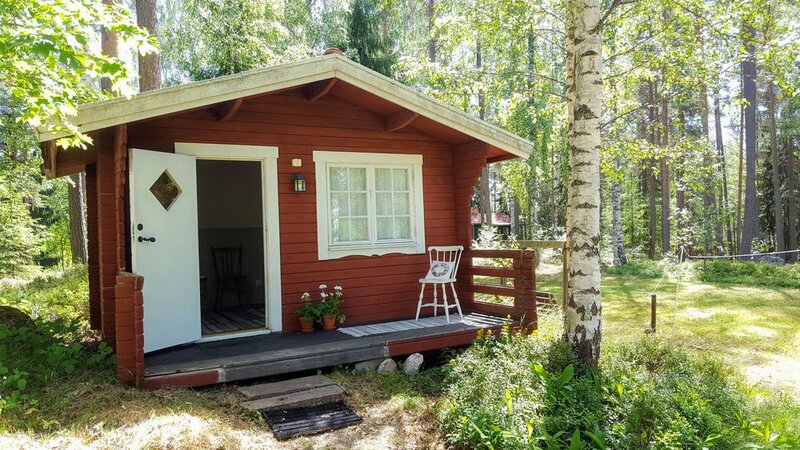 The property is about a 10-minute bike ride or a 15-20-minute walk into the main streets of Skellefteå, so it's very peaceful but still close enough to the action that venturing into town doesn't feel like a chore. ...and rode along the gorgeous Skellefte River (Skellefteälven). Dinner on this lovely Friday night took place at Bistro Bryggargatan, which had come highly recommended by our friends at Svedjan Ost. The Norwegian/Icelandic-inspired restaurant overlooks the river and serves modernized Nordic fare and kickass drinks with an emphasis on locally sourced ingredients. I started with burrata and pickled tomatoes followed by Entrecôte with grilled endive, crunchy fried quinoa, and a chili-spiced béarnaise sauce; Johan had the wild duck tacos and grilled teriyaki tuna. We also had a side of butter-tossed French fries, which were obviously fantastic. I must also mention the incredible sourdough bread that comes out in a little paper bag with a side of soft, salted butter. This was maybe my favorite part of the meal...??? Sorry to be a simpleton in the face of excellence, but I'm a sucker for crunchy, chewy, luxurious bread—just look at that crumb! After dinner, we went next door to Skellefteå Brewery (Skellefteå Bryggeri), the brewery component of which was certainly closed considering the late hour, but they have a separate building with a dance floor and a large deck/patio space to quench the nightlife thirst. We sipped beers and gazed out over the river, which is easy to do when the sun never really quite sets during the summer. ...which I'm going to tell you about in my next post, because this one is getting to be a bit long to give the actual cheese elements of the trip their proper due. Oops. Instead, let me show you Skellefteå's old church town, Bonnstan (Peasant's Town), which is just a stone's throw from that magnificent white church you've seen above. As the sign indicates (you can read it if you click the photo to enlarge), Bonnstan is one of Sweden's most well-preserved church towns, retaining its 19th-century character across 114 buildings. There are curtains, flowers, and other decor in the windows of many of these little houses, which creates quite a "lived-in" contrast from the ghost town impression. Speaking of ghost towns... Let us not ignore the World Cup events of 7 July as J and I most definitely changed into our Sweden jerseys and headed out to watch the match on Saturday afternoon following our cheese touring. Viewing venues cleared out rather quickly once it became apparent that Sweden was going to be ousted from the World Cup in a disappointing 0 - 2 performance against England—I can only assume the crowds scattered to find a conciliatory pint somewhere without a television. And on that note, I'll call it a day. Stay tuned for Part 2 with more Swedish lakes, blue skies, red cabins, and yes—CHEESE!